Play it safe. Remember, all uncooked meat contains microbes and spores and is therefore potentially hazardous. Pour the sauce you need into a cup or bowl and dip your brush or spoon in. When you are done, throw the extra sauce out. Never put it back in the fridge or serve it tableside. Even if the meat appears to be cooked, uncooked meat juices get on the brush and then get into the sauce. The sauce is contaminated. Even if you boil it or microwave it, and you have killed the microbes, spores are not all killed by heat. Use fresh, uncontaminated sauce for serving at the table. Your motto: When in doubt, throw it out. Click here for more about food, knife, and grill safety. Warm the sauce. If you can, warm the sauce in a pan or in a microwave to take the chill off. No sense putting 40°F sauce on 200°F ribs. Sizzle and crisp the sauce over direct heat. Just before serving paint on the sauce and place the slab over hot direct heat for ten minutes or so per side, watching carefully so it doesn't turn to carbon. At temps above 320°F, most sugars will begin to caramelize, creating many new molecules and much more complex flavor than just plain sugar. Sauce can go from red to black faster than a clean hog can go from pink to muddy. Incineration is not the only hazard with this technique. If you have perfectly cooked ribs, sizzling the sauce is a great opportunity to overcook the meat. If you use this technique, shorten the cooking time by about 30 minutes. The high heat will overcook the meat if you don't compensate for it. If you're cooking on a charcoal grill. Use the cooking method described in my article Best Setup For A Charcoal Grill. 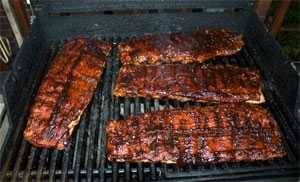 When the ribs are ready, remove the top water pan and put the slabs right over the coals and heat for about ten minutes on each side until the sauce bubbles. Again, stand there and watch the slabs so the sauce bubbles but does not burn! If you're cooking on a gas grill. Cook with the method described in Best Setup For A Gas Grill. When the meat is ready, crank up the heat to high and slather on the sauce. Heat it for about 5-10 minutes on each side or until it bubbles. If you're cooking on a smoker. If there is an offset firebox, perhaps you can sizzle the sauce over the flame on a grate in the firebox, but there's a lotta heat in there. I recommend using a gas grill for sizzling if you have one. If you have a gas grill in addition to your smoker, fire it up to medium or high about 30 minutes before the time to serve the meat, transfer the slabs to the gas grill, paint on the sauce, and stand there and watch them so the sauce bubbles but does not burn! If you don't have a gas grill, just place the saucy slabs about three inches under the kitchen broiler, back side first, for about ten minutes per side. Again, keep an eye on it. Torch it! Another good way to crisp the sauce is to whip out your propane soldering torch or invest about $30 in an amazingly hot butane culinary torch (at right) and scorch the sauce enough to caramelize the sugars. Do this at tableside to dazzle your guests (or send them running for the exits). Hooo-ah! Hit it again. Some folks like to sprinkle on a last splash of dry rub just before serving for an extra kick-o-spice. Apply the sauce at the table. A good strategy is to serve the meat without sauce and allow your guests to apply it at the table as a finishing sauce in whatever quantity they like. Skip the sauce. If the meat tastes great, and it should if you've cooked it properly, you might want to go skip the sauce like they do in many rib joints in Memphis. If you have a good dry rub, proper smoke penetration, and it is not overcooked, consider going commando.